"Quick, accurate service is critical"
Experience and long-standing relationships trump just about everything else when it comes to maintaining a customer's comfort zone. Of course quick, accurate service is critical as well; but when you need the right part right now, nothing beats picking up the phone and hearing the same voice you've heard for 15 or 20 years -- that voice that when it says, "You'll have it first thing tomorrow," you know that you don't need give it another thought or lose any sleep. It will be there. That's the sort of "old blue jeans" comfort level many customers have with the voice on the other end of the phone at Crown Automobile Mercedes-Benz on Montgomery Highway in Hoover, Alabama. Mike Ricketts started in the parts business 30 years ago, twenty-one of those years with Crown Mercedes-Benz parts department, the last seven as Parts Manager. But he's just a newbie when compared to Crown 30-year veteran Michael Tramell, one of those steady familiar voices on the wholesale-parts phone. "I think they built this place around him," Ricketts said of Tramell. That's an exaggeration, of course, but not by much. Crown Automobile Mercedes-Benz has been around for 40 years. Manning the phone next to Tramell is Marc Hooks with more than 16 years under his belt at Crown. "Marc is probably the most detail-oriented person I know," Ricketts said. "He just pays attention to everything." Nearly half a century of total experience between these two sales people at Crown translates into a lot of stability. "Customers know when they call, they are going to get someone who really knows what he's doing and is usually familiar with that customer's particular needs." These are just two of the seven-member parts team that worked together to move $6.8 million in parts through the end of October -- $2.7 million of that in wholesale parts. This isn't quite where Ricketts would like to be. "I'm not happy with those numbers," he confided, "$300,000 a month in wholesale is our goal." Ricketts did admit, though, sales volume is one of the big changes he's observed in his 21 years at Crown; it's much higher today than when he started. "Our parts business has grown quite a bit," he stated. Ricketts listed several reasons for the growth. The single most important factor, he said, was the decision to eliminate dickering over the price of body parts and just sell them for the suggested retail price issued by Mercedes-Benz. "We were wasting too much time and energy setting prices just to negotiate them down," he explained. "When we started quoting the manufacturer's suggested retail price about 10 or 15 years ago, it made everyone's life easier -- ours and the customer's." "We simply stopped charging freight and still don't charge for it," he said. "When we changed the way we priced and ended freight charges, we saw sales volume increase. When you service customers outside of your city, you really need to do something special for them." With customers located from Mississippi to the Carolinas and from Indiana to the Florida panhandle, Crown is doing plenty of business outside its city. Ricketts also pointed to the department's better than 90% fill rate as another reason sales are strong. Maintaining a parts inventory of nearly $1 million, most orders are filled right off the shelf. "Time is of the essence when you run a body shop," Ricketts said. You order a part and you've got to have it immediately. When you are quick and accurate like we are, you generate a lot of word of mouth advertising. Customers like doing business with us and talk us up." Not leaving marketing strictly to word of mouth, Crown uses Huntsville-based NAPCO to market its parts department around the Southeast. Ricketts uses a network of delivery companies including NAPCO and Advantage Delivery System to get parts to the far reaches of its sales area. Because Crown Infiniti is adjacent to Crown Mercedes-Benz, management streamlined their wholesale parts departments by integrating their sales efforts. The same three sales people service both Infiniti and Mercedes-Benz customers. "It helps increase sales when NAPCO is selling our business to let customers know they can get both Mercedes-Benz and Infiniti parts with one phone call," Ricketts said. Crown Infiniti averages close to $400,000 in inventory with monthly sales of about $250,000 -- roughly half of that is wholesale. 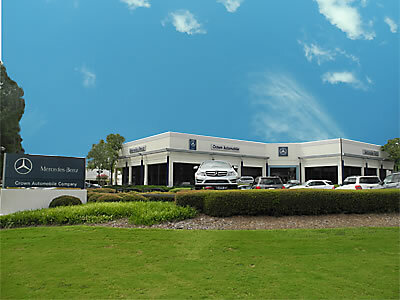 The parts department at Crown Automobile Mercedes-Benz is open Monday through Friday from 9:00 a.m. until 7:00 p.m.
You can reach them by phone at 205-985-4200 or toll free at 800-476-4669. Or, e-mail them at mricketts@crownautomobile.com.